Cork clinched a fourth successive Munster U21 football title in front of an attendance of 4164 on April 9th as they withstood a determined challenge from Tipperary in the decider in PÃ¡irc UÃ­ Rinn. Despite conceding three goals, Cork advanced to an All-Ireland U21 semi-final meeting with Roscommon on Saturday April 19th in Portlaoise. Sean Kiely struck a crucial second-half goal for Cork while corner-forwards Dan McEoin and Alan Cadogan hit 0-5 apiece to damage Tipperaryâs hopes of triumphing. Cork dominated the opening half with Cadogan, Brian OâDriscoll, and Kevin Crowley starring in the scoring stakes as they raced into a 0-10 to 0-3 lead by the 23rd minute. They also laid a powerful platform at midfield with Ian Maguire, Kevin Kavanagh and Kiely all contributing to their dominance in that sector. However Tipperary then received a lifeline when Colman Kennedy showed great composure to shoot to the net just moments after coming on as a substitute. Tipperary only trailed by 0-12 to 1-5 at the interval and were still in the hunt for honours at that juncture. The early stages of the second-half were dominated by Tipperary as they grabbed their second goal through Stephen OâBrien after great work by John McGrath and Greg Henry. Points soon after by Colin OâRiordan and Michael Quinlivan tied the teams at 0-13 to 2-7 by the 40th minute. However Cork settled their challenge with three points in reply and then John Corkery placed Kiely who unleashed a thunderous left-foot shot to the net in the 49th minute. Despite Henry firing home Tipperaryâs third goal of the night, Cork survived to win out by four points with man-of-the-match Cadogan sealing the victory with a late point. 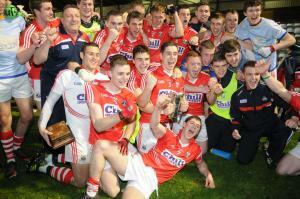 Cork now play Roscommon in the All-Ireland Semi-Final on Saturday April 19th at 3pm in Portlaoise. Scorers for Cork: Alan Cadogan, Dan McEoin (0-4f) 0-5 each, Sean Kiely 1-1, Brian OâDriscoll 0-3 (0-1f), Kevin Crowley 0-2, Mark Sugrue (0-1f), John Corkery 0-1 each. Scorers for Tipperary: Michael Quinlivan 0-5 (0-3f), Greg Henry, Colman Kennedy 1-1 each, Steven OâBrien 1-0. CORK: MicheÃ¡l Martin (Nemo Rangers); Jamie Davis (Douglas), Conor Dorman (Bishopstown, capt. ), Stephen Cronin (Nemo Rangers); Brian OâDriscoll (Tadhg MacCÃ¡rthaigh), SeÃ¡n White (Clonakilty), Kevin Crowley (Millstreet); Kevin Fulignati (Nemo Rangers), Ian Maguire (St. Finbarrâs); Killian OâHanlon (Kilshannig), Mark Sugrue (Bandon), Sean Kiely (Ballincollig); Dan MacEoin (Ilen Rovers), John Corkery ( Aghabullogue), Alan Cadogan (Douglas). Subs: Killian McIntyre (Carrigaline) for Sugrue (42), David Harrington (Adrigole) for McEoin (52), Kevin Kavanagh (Carrigaline) for Fulignati (55), Sam Ryan (St Finbarrâs) for Corkery (60), Darragh Murphy (Valley Rovers) for Maguire (60). Subs: Colman Kennedy (Clonmel Commercials) for Fahey (23), Joshua Keane (Golden-Kilfeacle) for Liam McGrath (46), Kevin Fahey (Clonmel Commercials) for Niall OâSullivan (50), Jason Lonergan (Clonmel Commercials) for Henry (52), Ian Fahey for John McGrath (52), Liam Casey (Cahir) for OâRiordan (56).